Dissolved gas analysis (DGA) is the most important tool in determining the condition of a transformer. By means of this method, problems as solid or liquid insulation deterioration, overheating, hot spots, partial discharges, and arcing can be detected. The most important indicators of the presence of an abnormal condition are the individual and total combustible gas generation rates and interpretation methods are provided by IEC 60599 and IEEE C 57 104 standards. In the 60s, Michel Duval of Hydro Quebec developed the Duval Triangle using a database of thousands of DGAs and transformer problem diagnosis. This method has proven to be accurate and dependable over many years and is now gaining in popularity. However, it must be recognized that the analysis of the gases and interpretation of their significance is at the present not a science, but an art subjected to variability, as the presence and concentration of various gases is dependent not only on the transformer condition but also on its characteristics (transformer type, location, load cycle, oil physical-chemical condition, type of oil preservation etc). Thus, a consensus on the acceptable content of the different gas limits and the normal generation rates is difficult to obtain. The experience of the authors in testing and helping to evaluate the results for the most important utilities of the Spanish electrical market has generated an important database with more than 20.000 registers. The aim of this paper is to report the statistical values (percentile analysis) of gas concentration and gas generation rates obtained from the analysis of these data. Duval’s Triangle was applied allowing to analyze the health of the transformer population, and the results have been classified attending to some characteristics of the transformers, as power rating, voltage, age, etc. 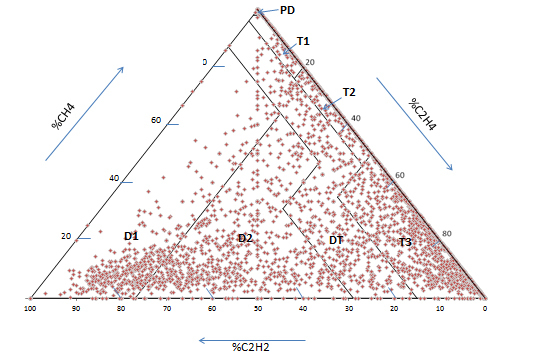 The result of this analysis can be used to establish gas reference values, and their typical generation rates.